Today is Small Business Saturday, Shop Local Saturday and also of course the busiest and best day in the Mill Road calendar – Mill Road Winter Fair! The event, which began in 2005 and is now held on the first Saturday of each December, has been in the planning for many months and will see residents, shops and the local community coming together to celebrate the area and all that it has to offer. The Fair is well known for its musical delights and this year looks set to be no exception. If you were on the bridge at last years Fair you may well have felt the earth move whilst watching The Brass Funkeys – there were reports that the bridge was, quite literally, shaking as people danced and enjoyed themselves! This year you can find the band hosting ‘The Brass Funkeys presents…’ outside Code Hairdressers on Mill Road, as part of Code’s Christmas Cracker. The band will be playing at around 3pm and during the day you can also catch Wil Buchanon, Thudbox, Live and Let Funk and Balkanoes on the stage. Code will also be serving mulled wine and cider and there’ll be lots of other activities including vintage hairdos and facepainting. All along Mill Road there will be lots of other performers and musicians throughout the day, including the Jackson Creek Band at 2pm by the Avenue of Limes whilst at the same time The Scissors are playing at Ditchburn Gardens and The Centimes will be at Gwydir Street Car park. Argyle Street Housing Co-operative will also be hosting their much loved Winter Fair stage, with music from 11am – including the Arco Iris Samba Band at 13:40, Dave Crow Barr at 15:00, Jam Band Caravan at 16:00 and Fara Fiddle at 17:00. This will culmiate in an ASH Co-op Jam on the stage around 18:30. As well as music, ASH Co-op car park will of course also be playing host to a range of stalls selling festive gifts and goodies, second hand goods and plenty of books. Other activities include a Craft Market at the drama studio on Covent Garden, where you can find The Map Project team and lots of art and craft stalls. There will also be a Winter Wardrobe Fashion Show at the Salisbury Club on Mill Road, the Cambridge Lindy Hoppers dancing in the streets of Romsey and the Carnival Parade – which will be setting off from the town end of Mill Road around 12:15 before making its way down to Coleridge Road. One of the great things about Mill Road Winter Fair is being able to wander between all the different shops, many of whom are offering homemade food and drink on stalls outside. There will also be a number of food stalls at Gwydir Street Car Park, including Mr Cake – he’s the chap that made the papers last year when he left his job by icing his resignation letter onto a cake! 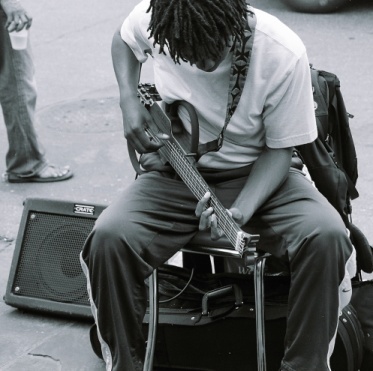 Music scene must be heard! I had originally intended to write this blog article a few months ago and for it to be about our music venues in this part of the City. I was going to lament that although the Boat Race is now long gone and Anglia Ruskin University no longer has a weekly line-up of gigs open to the public, at least we still have the Man On The Moon as a last remaining dedicated medium-sized gig venue. However, it was announced a couple of months ago the the Man On The Moon would be closing at the start of October, and even after protests it sadly did close at the start of this month. Landlord John and his family moved from the White Hart pub (which became the Back Street Bistro restaurant) on Sturton Street in 2000 to take over at the Man On The Moon, and over the next thirteen years the pub became well known both locally and further afield for its music. They’ve hosted some big names over the years – including Therapy? and Wendy James from Transvision Vamp – as well as regular music nights across all genres including hip-hop, soul and rockabilly and even lindy hop dancing. The Man On The Moon has now been taken over by new leaseholders and a new landlord has also been chosen. Although they are keen to open the pub again soon, I am not yet sure when this will be (the new landlord has also already taken on another local pub – The Royal Standard, on Mill Road). Following on from its closure there had been a peaceful protest in the form of a community cafe at the Man On The Moon, but that came to an end last week. However, the previous ‘Moon team are still booking gigs at other venues and are planning for the future, so if you want to get in touch with them you can contact them via the details on their website. Since we’re on the subject of losing music venues, it seems only right that I mention the Boat Race on East Road – which I’m sure many of you will remember. It was a dedicated gig venue that had music seven days a week and was known for hosting up and coming talent – the likes of Franz Ferdinand, Placebo, Oasis and Groove Armada all played there before making it ‘big’ – including local bands and artists such Right Turn Clyde, Ezio and The Broken Family Band. The Boat Race closed almost ten years ago – much to the dismay of local music lovers – and although there were campaigns to save it (and bring it back ) it was sold and eventually became The Snug. Of course the Portland Arms (and in recent times also the Cornerhouse) put on some great gigs and are well known locally for hosting up and coming bands like Beverley Kills and favourites such as Editors, Akira The Don, Carter USM and Ellie Goulding – but it’s on the other side of town; and besides, a City with a population in excess of 120,000 surely deserves more than one dedicated medium-sized venue, doesn’t it…? The last year has thankfully seen an increase in gigs happening on and around Mill Road and a number of the local pubs and cafes now have regular music nights. However, the last remaining dedicated medium sized gig venue in this part of the City was the Man On The Moon. Given the current lack of local music venue and the need for action to make sure our music scene doesn’t suffer any further, there will be a special meeting TONIGHT to talk about making things happen! The ‘Campaign for a Music Venue’ open meeting will take place at The Hopbine (sister pub to the Portland Arms) from 7:30pm. It’s a public meeting and all are welcome, so if you support the idea of creating/developing a dedicated music venue, you have some ideas on how it could work or you just want to find out more, then make sure you go along tonight. The Telegraph newspaper are running a campaign called Reinventing the High Street, aiming to put the heart back into the country’s traditional high streets. People are asked to nominate their favourite simply by emailing highstreet@telegraph.co.uk. I don’t know about you, but I think there’s something pretty special about Mill Road and I think it deserves a place among the best that the UK has to offer. Not only is the Mill Road area home to Cambridge’s best independent pub, coffee house, home & garden shop, specialist food shop and record shop (all awarded this year in the Discovering Cambridge awards) and home to the Independent Drinks Retailer of The Year (as voted at the UK Drinks Retailing Awards 2013) but it’s also the location of CAMRA‘s Cambridge City Locale Pub Of The Year 2013. There’s a range of events on throughout the year – including the Romsey Art Festival, several street parties, various beer festivals and of course the forthcoming Mill Road Winter Fair – as well as regular music nights at lots of different venues; and next week sees the first ever Romsey Calling music festival on Mill Road. Mill Road has even been used as a location for music videos (like Mikill Pane’s ‘Good Feeling‘), films (Neil Morrissey was here last month filming a new movie, Caffiend), TV programmes (including Antiques Road Trip) and has had residents such as Douglas Adams, Dave Gilmour, Syd Barrett, Angela Hartnett and Amy Williams over the years. It even has its own blog and its own radio show – ‘Our Mill Road‘! There’s lots more I could say about Mill Road, but too much for one blog post (hence the whole blog!) but suffice to say it’s full of community-spirited individuals and groups and has lots of people living, working and socialising in the area and keeping Mill Road the coolest street in Cambridge. All you need to do to nominate Mill Road is to email highstreet@telegraph.co.uk and let them know! You know what they say – there’s something about Mill Road… . Local MP Julian Huppert launched his Discovering Cambridge competition in January, in order to support the independent shops and businesses we have here in Cambridge. People nominate their favourite in a different category throughout each month, with a winner announced at the end of the month. There will also be an over all winner announced at the Mill Road Winter Fair on 7th December. The Mill Road area has had winners in three of the six categories so far and now lays claim to Cambridge’s best independent music shop (Rhythm Online), best independent specialist food & drink outlet (Limoncello) and best independent coffee shop (Hot Numbers). The category for July is best independent pub and you can nominate your favourite by email, twitter or post – see Julian Huppert’s website for more information. Best independent pub is an interesting category – the vast majority of pubs are owned by larger breweries and chains; yet they are, in the main, run by a landlord and/or landlady who probably runs only that pub and who brings their own character to the place. Pubs that are part of larger breweries and chains often have certain restrictions placed on them (such as only being allowed to purchase their beer from a specific provider) but that doesn’t mean that there isn’t plenty of room for making their own unique mark in their local communities (in fact, I reckon most people would be more likely able to name the landlord/landlady of their local than which pub company it belongs to…). I’m not quite sure what definition Julian is going with for his competition (and where part-tied pubs fit in) but if it’s only pubs that are not tied to a larger chain or which are the only pub run by that tenant/owner, then that leaves just a small handful in Cambridge. I’m going to nominate the Earl of Beaconsfield – Susie and Matt took over the pub last October and have made it into a really lovely place that not only looks after its existing regulars but is welcoming to new visitors too. There’s all sorts of regular music nights (Sunday blues jam, Monday open mic session, Tuesday acoustic jam, Thursday Irish music session and regular jazz Saturdays) and they’re all free, the back room that was previously out of bounds has now been completely transformed into a large games room, the pub now serves food and the beer garden has also had a much needed makeover. They’ve also set up Facebook and Twitter accounts for the pub, as well as recently launching a brand new website. Given all the hard work Susie and Matt have put in to the Beaccy and the great changes that have come as a result in such a short space of time (and bearing in mind the fact that they had never run a pub before!) I think they thoroughly deserve some recognition for their efforts. Mill Road itself has lost over 60% of its public houses in the last twelve years alone, and now just two pubs remain. So there’s never been a more important time to make sure you use your local, and the sunny weather is the perfect time to try out the ones you haven’t been to for a while or visited before. Just don’t forget to nominate your favourite indie pub by 31st July (tomorrow!). The Cambridge Buskers & Street Performers Festival 2013 will be taking place on the weekend of 28th-30th June. The festival, which started in 2008, sees lots of performers and musicians playing across the city and this year there’s a packed line up of performances on and around Mill Road – including outside the Earl of Beaconsfield, Urban Larder, Perfect Pizza, Hope Street Yard and The Co-operative. The festival programme has a list of all the acts performing and the locations of each – though do check the website for updates – and talks about what a great area Mill Road is (see page 12) and even mentions this very blog! There’s lots of acts performing on all three days and on Saturday at Hope Street Yard there will also be various food stalls, including Mill Road’s own Perfect Pizza and local ice cream extraordinaire Jack’s Gelato. If you haven’t tried Jacks Gelato before then I highly recommend you do – as well as delectable classics such as chocolate and vanilla, Jack makes lots of other tempting flavours and even his own allotment rhubarb sorbet! He can be found throughout the summer at various locations around town, including Mill Road. Saturday 29th June is also the day of the Gwydir Street Party – which is Victorian themed this year to mark 150 years of the street – and there will be lots of music and entertainment throughout the day including a hog roast, beer festival, circus performers, a puppet show and several stalls. So it certainly looks like the Mill Road area is the place to be for the last weekend in June! Below is the current line-up of buskers and performers who will be around Mill Road as part of the festival. Further acts throughout the day TBC. Landmark Seizures project Special Closing Event – Station Buildings (opposite Swiss Laundry, next to Station Cycles), from 12pm. Discussion, readings + performances throughout the day, with a special party 7-9pm. Hosted by Aid & Abet. St Matthews Church, 12-3pm. Cakes, DVD’s, books, toys & handmade items for sale. Tiger Blue duo – Earl of Beaconsfield, 8:30-11pm. Last Gang In Town – the Man on the Moon, from 7:30pm. Music from: New Town Kings + Defekters + Last Gang DJ’s. Blues Jam – Earl of Beaconsfield, from 8:30pm. Surviving Strings – The Brook, 8:30pm. Acoustic duo playing hits from the 60’s through to present day. Open Mic Night – Earl of Beaconsfield, from 8:30pm. Irish music session – The White Swan, 9-11pm. Quiz night – The Six Bells, starts 9pm. Acoustic Jam – Earl of Beaconsfield, from 9pm. Hosted by Johnny Wright, all welcome. Dr Doodleys Drink & Draw – Hot numbers Café, 7:30-9:30pm. This fortnights theme is picture books and is hosted by Simon Prescott. Quiz Night – The Dobblers, from 9pm. This weeks top prize is a rollover of £57. Katharine Rose – Hot Numbers Café, 7:30-10pm. Indie/folk piano and singing. Irish music session – Earl of Beaconsfield, from 9-11pm. Quiz Night – The Brook, starts 9pm. Four Farces – Mumford Theatre, 7:30pm. A selection of one-act farces presented by the European Arts Company. All about CamLETS – CB1 Café, 7:30-9pm. Talk with Richard Robertson about Cambridge’s local exchange and trading system – CamLETS. Dr Doodley’s Drink & Draw Artists annual exhibition – Hot Numbers Café, runs until 31st May. Over fifteen artists who attend Drink & Draw exhbiting their work. Mohammed Djazmi ‘s ‘Social Commentary’ exhibition – Williams Art, until 31st May. 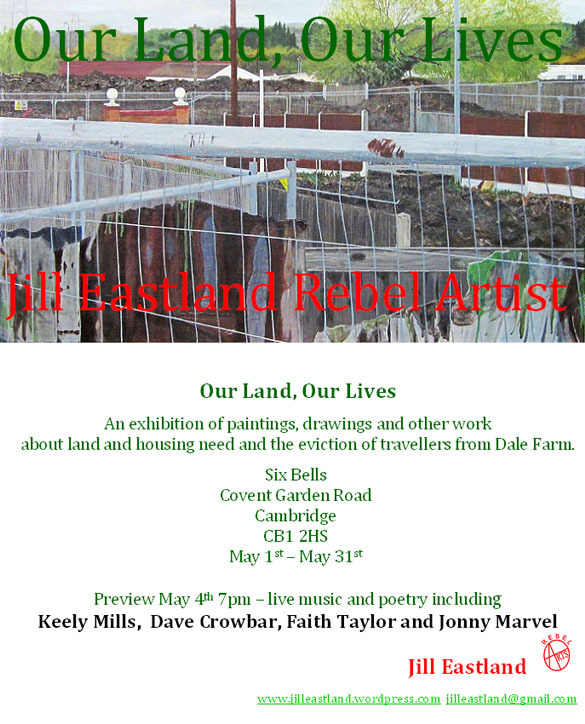 Jill Eastland’s ‘Our Land, Our Lives’ exhibition – The Six Bells, until 31st May. Do check with venues/organisers for more info and updates.